Arriving 20mins early, we secured seats on the bus and we were soon heading out of Nuwara Eliya and just beginning to realise the extent of the golf course. The ride is a spectacular 2hr descent, winding down an endless series of switchbacks and hairpin bends that the bus was only just able to negotiate. Tea plantations and tiny roadside hamlets dominated the mountain scenery and if the train ride is famous, then so should this journey enjoy an equal standing. From Horton Plains we had descended steeply for a total of 4 and a half hours, all the way to Kandy. From the Highlands to the Midlands, only for the last 30kms villages gave way to towns, the main streets awash with billboards and signage. Fortunately the bus driver had no chance to speed as the sheer amount of traffic forced us to a crawl along Kandy’s cluttered streets. Shazz rang Janaka at our Airbnb, the Jasmine Hill Hotel to send a tuk tuk to come and pick us up. Suddenly, we were at the chaotic bus station. The long, narrow space was jammed with countless buses and tuk-tuks, but somehow, miraculously, things were able to keep slowly moving, afterall, that’s the point of the place, isn’t it?! The touts (which I’d read about previously) took no time in descending on us with offers of tours, a ride to our hotel and warnings about other tuk tuk drivers. 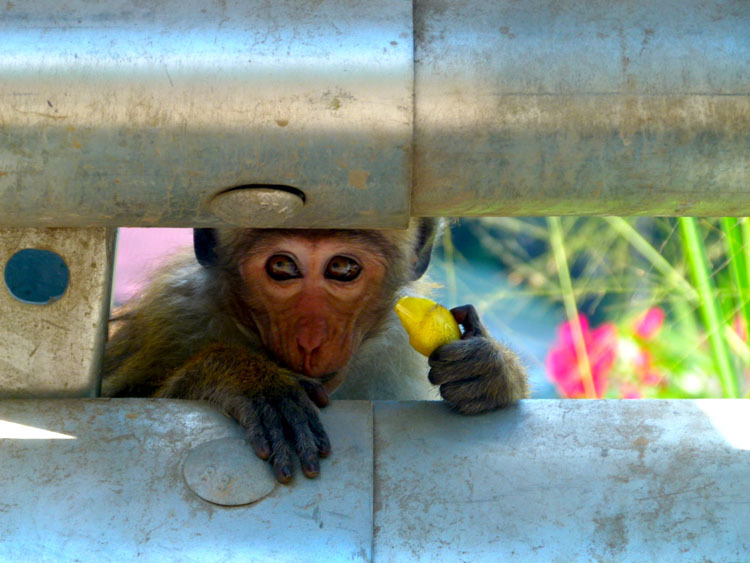 We, of course, told them the bare minimum – we had a ride coming, no need to hang around! In the nicest possible way of course. We were told a local mafia runs the bus station and target tourists especially. 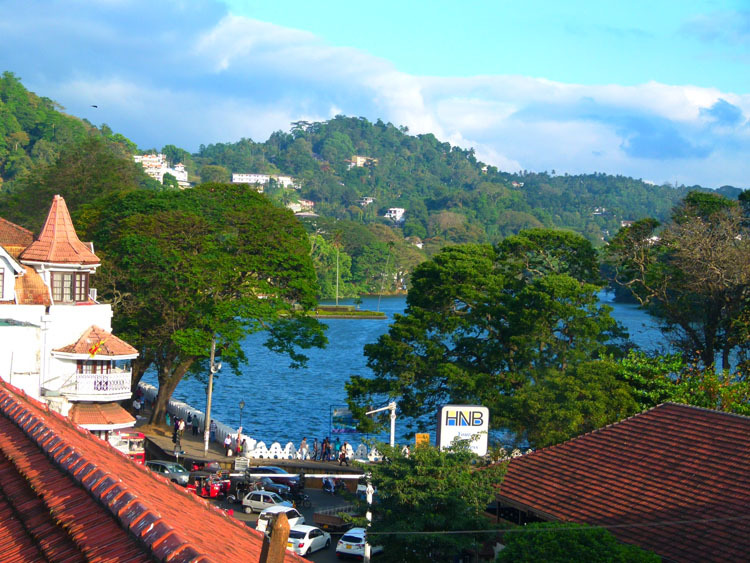 Kandy is surrounded by steep mountain sides, to access our hotel we need to crest one of these ridges at a place called Anniewatta about 2kms from the city centre and lake. The manager, Janaka, greeted us with a fresh fruit juice and let us pick between 2 really nice rooms with views. Other than the obvious reasons for being in Kandy, we were to meet up with a friend of ours from Hong Kong, a German girl we’d met in China and had visited us in Saigon. As soon as we’d settled and had something to eat, we arranged a tuk tuk to drop us in town so we could see a little before meeting Bettina who had caught the train up from Colombo and was checking out the Botanical Gardens for the afternoon. We took a stroll around the town and some of the lake before catching up with her at the clock tower, a popular landmark in Kandy. 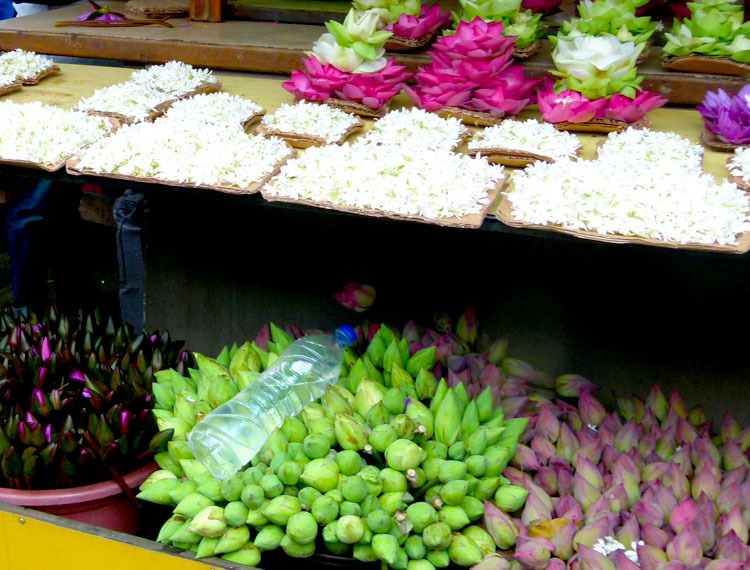 Being the Sri Lankan National Day, most of the shops and cafes were closed, and no alcohol was allowed to be served. Fortunately, we didn’t have to walk far before we found the Licensed To Grill Restaurant with a top floor open area to enjoy the view as well as catch up. We really enjoyed our chance to catch up, but trying to get a word in edgeways over the squillion crows swarming up and down the street was hard work at best. The crows have flown from all around to congregate in the trees of the main street and wage an aerial war with the equally huge contingent of minor birds who vie for the same space amongst the tree branches. The resulting melee is quite eerie and you’d be forgiven for thinking you’re on the set of a horror movie. 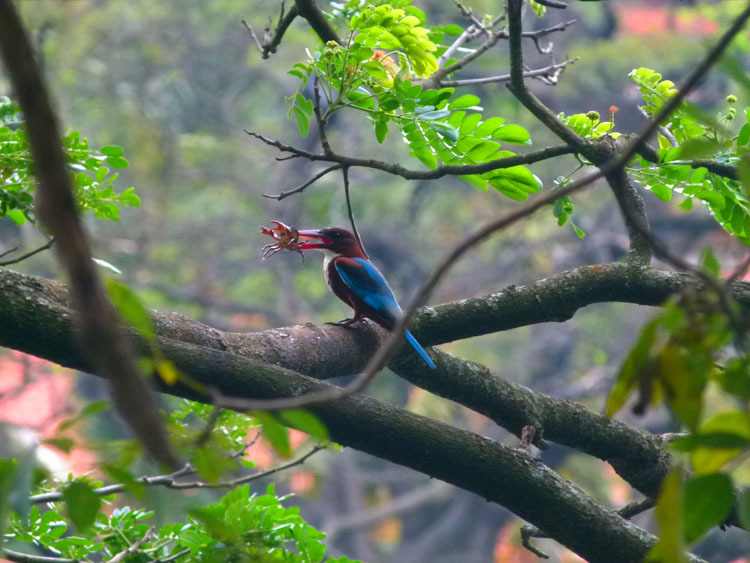 Every time the birds would settle in the branches, someone would let off a firecracker and scatter them to the air, screeching their displeasure. It’s not the first time we’ve encountered the crows here in Sri Lanka, and we’ve wondered why there’s so many in places we’ve stayed, but nothing we’d seen previously had prepared us for the sheer number here in Kandy. As Bettina had only a short stay here in Sri Lanka, we bid her farewell at the clock tower. She was heading up into the highlands in the opposite direction to us. We brushed off a couple of comedian tuk tuk drivers who thought we’d pay a plane fare back to our hotel, and eventually had to settle for 300rps (a much better and fairer result). Janaka, being the perfect host, had kept 2 beers aside for us to enjoy when we got home. The next day we spent the morning working before going back into town to walk the lake circuit (2.3kms). 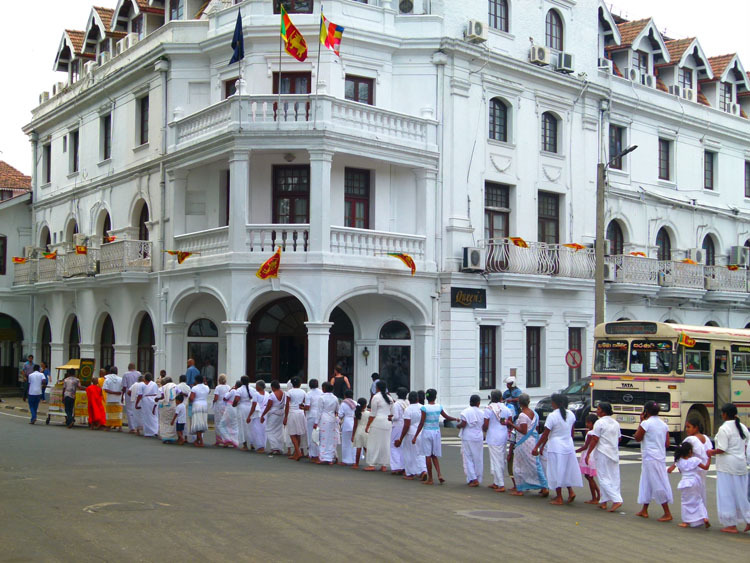 We began with a climb up to a viewpoint near the Indian Consulate and opposite the Temple of the Tooth (Kandy’s most famous attraction). Dinner and a couple of sundowners was at the Skybar, just up the road from the lake, which was pretty good. Once again we could only watch on as the sun set to the sound of a million crows and minor birds unleashing all hell. As Bettina had told us that the rather steep entrance fee to the Temple of the Tooth was hardly justifiable, we had decided to make the one attraction we’d visit the Botanical Gardens. After the crowded city centre, the gardens were a pleasure. The entrance fee here is certainly warranted as the whole area is immaculately maintained. It was quite hot again, but there’s plenty of shade to be found and lots of interesting trees and plants from all over the world. 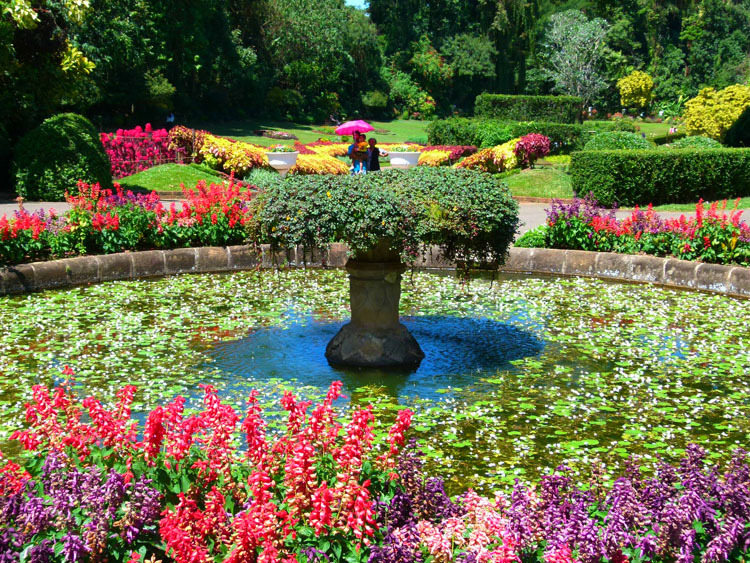 The gardens are the 2nd largest Botanical Gardens in the world, only behind Kew Gardens in London. The entrance fee includes a map that guides you around the many different sections and helps you organise a logical way to get the most out of your visit. Its particularly handy if you want to find a toilet or kiosk to buy water. 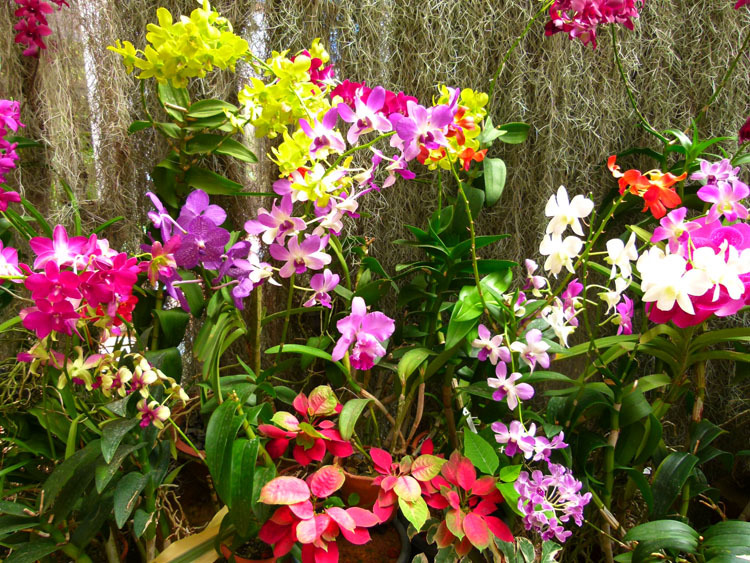 Not to be missed is the Orchid House with a huge number of different varieties and the biggest splash of colour you can imagine. Included in the dazzling display is the Grammatophyllum Speciosum, the largest orchid in the world. We took a local bus there and back, it’s pretty cheap and easy, and the ticket guy will tell you when to get off if you ask him nicely. The ride back in the afternoon traffic was so slow, when we got within a kilometre of our turnoff, we just got and found a tuk tuk. Hands down the best attraction in town is the Botanical Gardens. It’s a 5kms bus trip. Take any bus heading towards Peradeniya and ask the ticket guy to tell you when to jump off. You can’t really miss it though. You won’t see any teeth at the Temple of the Tooth – just sayin’. Staying on a main road outside of the town centre will mean being able to take a bus instead of paying the ridiculous price demanded by tuk tuks. Once again, a fairly overpriced place! Next story Dambulla/Sigiriya – For those about to Rock!